When playing RPG game, the Gunners are very exciting and hot character. Especially with this style, the rocket fired arrow, ice arrow, lightning arrow, abcxyz arrow, etc. is super simple to them. 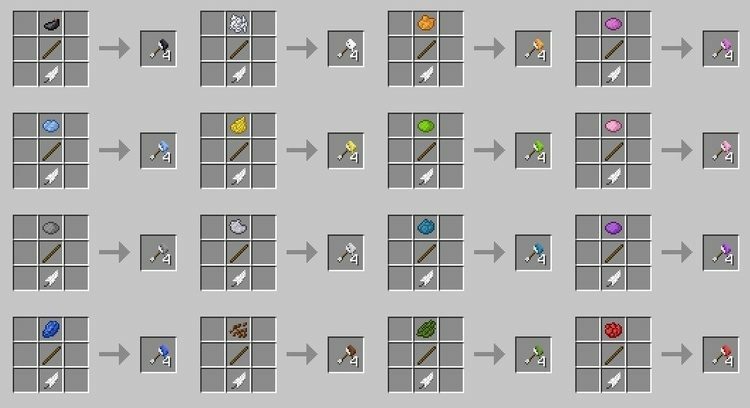 So why are we only able to fire off a regular arrow in Minecraft? Bullseye Mod 1.12.2/1.11.2 is for you. A big fault is here! Bullseye Mod can satisfy you by using the bow to shoot full of different and unusual arrows. It doesn’t cause any damage when hitting people or monsters. Also, it does not nibble the object shot. You can use to practice arrow skills with this arrow. When shooting the right object, this arrow will call a bolt of lightning and burn the object. Just as you throw eggs, Egg Arrow will likely hatch chicks when impacting and then bursting, the difference with eggs is that you can shoot it go very far. 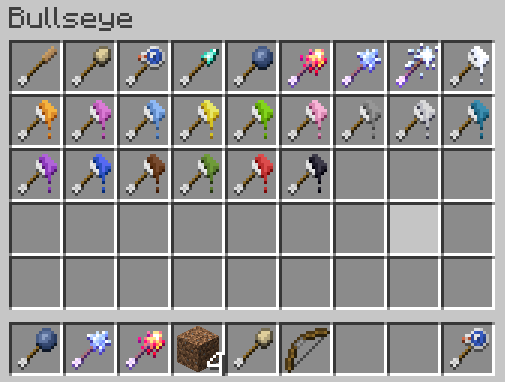 Moreover, you will get 4 egg arrows (quite a profit) with an egg. It is used to fire out, destroy torches, erase the dyed color of blocks or leather clothes of other players wearing. It causes 2 times damages than a normal arrow. It sounds like wasted if you shoot badly, you should consider carefully before making this arrow. When shooting in a right position, it causes serious damages and explodes a small scale. It is useful to destroy the village or large objects. It is used to burn the forest, burn houses, fire zombie, fire all things that we need to burn and it can melt the ice. When touching the water of landscape, Ice Arrow will turn it into ice or cover a layer of ice above. Because it causes 1/8 damages as a common arrow and it will dye the blocks with other mobs, this is a proper arrow to play paintball (fake fights) or used to paint the walls. 1. Download Forge Installer, Bullseye.jar. 2. Right click, Run as Administrator and press OK to install Forge. 3. Open Start on Desktop. 5. Type %appdata% into Run and press enter. 7. Put jar file of the mod you want to install into mods folder and then run Minecraft.